Lots of birds this morning, few in camera range. 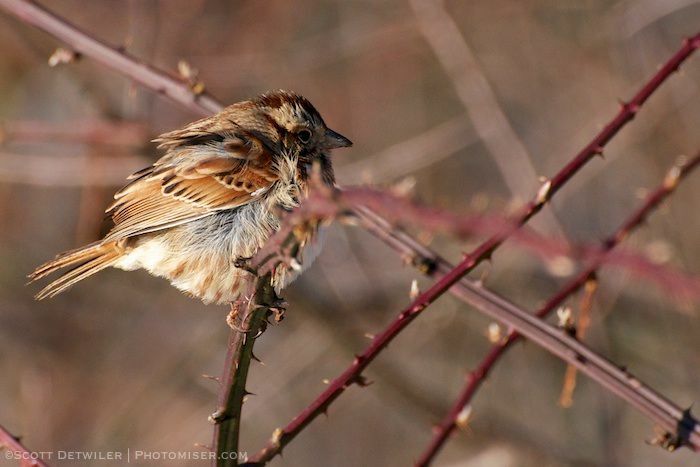 This sparrow lingered in the morning sun…and a bit of a breeze..to give me something to work with. I am not sure of the species. I think it might be the same immature white-throated sparrow I saw in nearly this same location a few days ago. Taken with a Nikkor 70-300mm AF-S ED VR on a Nikon D90. Here it is with a slightly different pose. I went with the featured version because he faced a bit into the sun. However, the second version is sharper, and a bit more enigmatic. They say eye highlights bring photographs to life, but life isn’t all highlights, eh?